Cathy Lyon has been a stitcher for 40 years, enjoying a variety of threads, fabrics and designs. Originally raised in Maryland, her life and husband took her to Laurel, Maryland and the start of a long lasting friendship with Michelle and the Stitching Pretty shop. She was one of the original stitcher groupies of the shop. The warmth and calmness of Southwest Florida had her leaving Maryland and settling in Port Charlotte, where she established the Golden Needle as a cross stitch haven in 1995. Now retired from the everyday life of a shop owner, her direction and friend has taken her to her next chapter: designing. WhiteLyon Needleart has now been born, starting with a partnered piece in St. Charles, Cathy has begun a new journey. Love of color, silks, Happy sayings, and inspiration of the needle, a new designer has now been included in the Stitching Pretty family. I have come full circle. 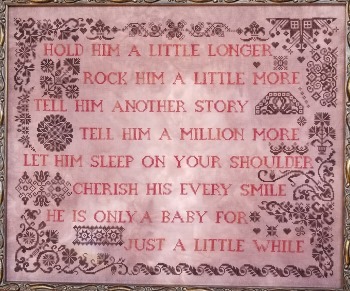 This beautiful poem about Motherhood is surrounded by many delightful lacy Quaker motifs. Done in 2 colors it is easily adapted to your color scheme. approx dimensions 21 x17.